KUWAIT: Schools of Sheikh Ahmad Al-Farisi and Ibn Asaker (Ahmadi), Ibn Tufail and Zaid bin Ali (Jahra), Ammar bin Yasser and Saud Al-Abdelrazzaq (Farwaniya) qualified for the finals of the third Kuwait Martyrs Mini Goal Football tournament during qualifying matches held earlier. The teams of Mulla Hassan Al-Kandari and Saeed bin Al-Aas (Hawally) qualified during the qualifiers held in December so the total number of teams is 8 so far. Coordinator General of the tournament Hassan Al-Khawajah said the tournament is being held under the patronage of Al-Shaheed office of the Amiri Diwan in coordination with the education ministry, and is being held under the knock out system. He said 8 teams qualified representing Hawally, Ahmadi, Jahra and Farwaniya, while the qualifying rounds of the capital and Mubarak Al-Kabeer governorates in addition to private education. Al-Khawajah said the previous rounds witnesses strong competition between teams with 24 teams in Ahmadi, 12 teams in Jahra and 18 teams in Farwaniya participating. 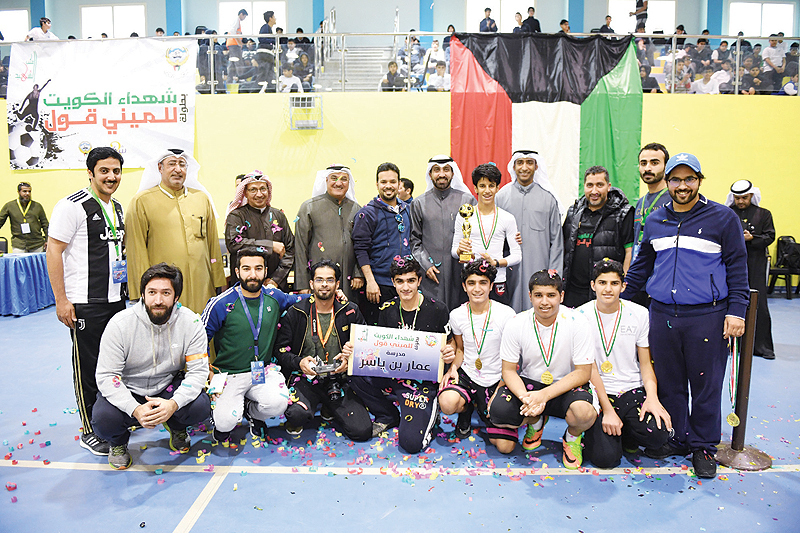 Hassan Al-Khawajah said the finals are being held at Martyr Fahad Al-Ahmad Center in Daeya area during the period 10-12/12 to coincide with Kuwait celebrations of national days.